In this video we discuss how the block paradigm has shifted from creating blocks in our module to instead creating block factories. 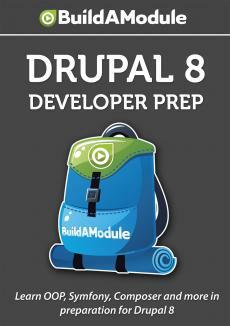 This is a lot of fun if you haven’t seen this particular feature of Drupal 8 before. Along the way we notice that settings dialog boxes don’t seem to be showing up, and we track down the source of that problem to an error in our Drupal 7 module code. Okay. Before we go through the process of taking the SystemPoweredByBlock code and repurposing it for our own block, one more important thing to understand about these block plugins -- now this is a block plugin, right? The important thing to understand is that this does not define a block. So this is basically a factory for blocks. This will allow you to create unlimited numbers of blocks of this type. This just defines the parameters of the block so that's why if we go back to the user interface and we look at this and we scroll down to the bottom and see this "Powered by Drupal" block, we can go up here and we can add another "Powered by Drupal" block. Now, as just a quick side note, when I click this, it's not doing anything and so what my guess is is that there is something inside of my module code that's getting in the way of this pop-up showing. So I'm going to go ahead and open up the inspector and I'm going to look at the Console, and I'm going to minimize this a little bit and scroll down. What I'm going to do is look at my network here and when I click "Powered by Drupal," what happens is it loads another page here. If we take a look at this -- I'm going to click on this and I'm going to look at Preview here -- what we can see here is a set of errors.